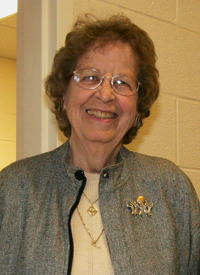 Lee Morrison was born and raised in Savannah, Georgia, where she played football and baseball with the boys in the neighborhood and was a horseback riding nut. Most of her young summers were spent at the beach or at camp where she played every sport she could. Dr. Morrison attended Ward Belmond Jr. College in Nashville Tennessee, a women’s college, where she majored in physical education and equitation. Soon after, she graduated from Georgia State College for Women with a Bachelor of Science in Education (with a major in physical education). Dr. Morrison then earned a Master of Arts in Education from George Peabody College (now a part of Vanderbilt University) and a P.E.D. from Indiana University with a major in P.E. and minor in Measurement. Although Dr. Morrison’s first job was at a small college in South Carolina, she had always wanted to come to Virginia because of her interest in history. After five years Dr. Morrison came to Madison College for an interview and fell in love with the area and the college. “I was also interested in Virginia colleges because I knew a number of them had teams for women, which Georgia and South Carolina did not and I had begun to question ‘why not!’.” While at Madison, Dr. Morrison coached everything from basketball, field hockey, and swimming, to WSI, team sports, dance (modern, folk, and social), and archery. In the classroom, Dr. Morrison specialized in History and Principles of Physical Education, Measurement and Evaluation, and a graduate class on Women in Sport. Dr. Morrison was also WAA advisor, which included doing the May Day celebration and later was more and more involved in the intercollegiate athletic program (she coached basketball again for a couple of years and coached field hockey for 17 years). Eventually Dr. Morrison went into administration full time as Associate Athletic Director. "I am a teacher at heart and have had numerous opportunities to teach here: in the class room, out-of-class activities, and in my coaching and advising capacities. JMU cares about its students and I want that to continue. I think JMU has always tried to provide sufficient classes, places, activities, teams, etc. so that each student can find a home in which to learn and grow. And I hope that each student finds some teacher to have as a mentor, who encourages growth even after leaving. Madison College and JMU presented opportunities for women in sports when many other colleges and universities did not. I hope we will continue that effort today when the discrimination is more subtle and many mistakenly believe the battle for equality and equity is won."